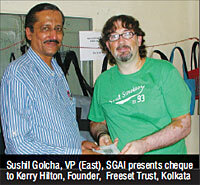 Sgia recently presented a monetary contribution to the Freeset Trust, Kolkata. In continuation of its various initiatives towards supporting those conn ected with the Screen Printing industry, Screenprinting and Graphics Association of India (SGAI), recently presented a monetary contribution to the Freeset Trust. Enthused by the noble work being done by the Trust and its emphasis on using Screen Printing as a means of social empowerment, the SGAI managing committee took the decision to contribute a sum of money that would assist in their social endeavours. SGAI conveyed its best wishes and support.